So many bands of the 60s were inspired by the blues and the bluesmen that came some 20 years before them. Manfred Mann, The Rolling Stones and Led Zeppelin, to name just three, launched their career with that great blues sound. This week’s song was never a hit single but a well-known album track by Led Zeppelin, a band who decided not to aim their music at the singles market, but to concentrate on albums. 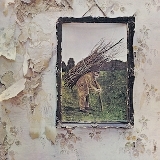 This week’s choice is the song that closes their classic 1971 album Four Symbols or Led Zeppelin IV as it’s also known, that song is When the Levee Breaks. Just two months after that album entered the chart, the word levee became more popular when Don McLean told us about driving his Chevy there only to find it was dry, in American Pie. Well Don’s levee may have been dry, but the one Led Zeppelin sang about was quite the opposite. A levee, for those who don’t know, derives from the French word levée which itself is taken from the female participle of the French verb lever, which means to raise, and is a small, lengthy ridge or embankment which runs parallel to a river and is meant to regulate its water levels. At the end of the American Civil War in 1865, many former slaves had to move to a more fertile land that surrounded the Mississippi River so they could rebuild their lives and many of them became farmers. A whole heap of little shanty towns materialised all over the place and order to protect themselves from the river flooding they built a man-made levee for their own protection. In March 1913 there were many days of heavy rain and a number of rivers across 11 different states were subjected to major flooding, the worst hit were in Ohio, Indiana and Mississippi. This whole disaster became known as the Great Flood of 1913 and the second worst in American history after the Johnstown Flood of 1889. The song was based on that collapsed levee but only paid tribute to some 14 years later, in 1927 when the 22 year-old American Delta blues musician and songwriter Wilbur McCoy, known as Kansas Joe, wrote the music to When the Levee Breaks. He teamed up with another blues musician, Lizzie Douglas but known as Memphis Minnie who wrote the lyrics and recorded their version together. Soon after, they married she became known as Memphis Minnie McCoy. Led Zeppelin’s vocalist, Robert Plant, had a copy of the recording in his private collection, listened to it and took it to the band’s guitarist, Jimmy Page, who gave the music a facelift and then the band recorded it. A lot of different techniques were used especially with the drums, very much like Joe Meek used to do. The whole thing was recorded at Headley Grange studio in Hampshire and John Bonham’s drums were set up in a stairwell with the microphones placed vertically up the stairs so when the drum sound echoed it was caught on those mic’s to find that the captured sound was unique and distinctive. The track was recorded at a faster tempo than we hear it on the album, then slowed it down. Robert Plant then recorded his vocals in a key that was in between the original recording and the slowed down version which is what gives the song a slightly strange flattish sound. Jimmy Page also tried something new with a reverse echo putting the echo before the sound. In fact the only natural thing on the track is Plant’s voice. The whole album was mixed in both the USA and the UK, but the one track that was virtually untouched was When the Levee Breaks because everyone decided the original mix suited the track well and didn’t need tampering with. The drum intro has been sampled on numerous occasions but most notably by Dr Dre on his track Lyrical Gangbang, on Beats and Pieces by Coldcut and on Rymin’ And Stealin’, the opening track on the Beastie Boys’ 1987 album License To Ill.